If you live in America you qualify for the Obamacare benefits and can use the system if you are a permanent resident or citizen. Green Card holders, permanent residents, are eligible for Obamacare. Therefore, if you hold a Green Card and your income is low enough to meet the eligibility requirements, you can buy subsidized health insurance. If you are lawfully in the United States with the relevant documentation you can access the Health Insurance Marketplace. At the same time, all citizens and Green Card holders are subject to the requirement that says you must purchase health insurance or pay a fine. All legal residents and citizens of the United States can get insurance cover through their work, by purchasing a private plan, or through Medicaid and Medicare. In many states, however, you will not qualify for Obamacare or Medicaid until you have been a resident for five years. While Green Card holders and other permanent residents of the US will see changes through the Obamacare reform, those people that live and work in the US illegally won’t see any changes to their healthcare status. Immigrants and workers in the United States that do not hold official documentation that allows them to stay in the country will not be eligible for Obamacare. In any case, undocumented immigrants are also ineligible for Medicare and Medicaid. Immigrants without a Green Card can receive medical treatment through services that give help without regard to immigration status, such as public health programs like the Federally Qualified Health Centers, or at certain community health centers. Immigrants may also be insured through the healthcare insurance of a legal resident such as a spouse or a parent. Immigrants may also purchase insurance from outside the Healthcare Exchange Marketplace. What about Students and Temporary Workers? Any person in the United States on short-term business, or as an international student at a US College or University, is considered to be a non-immigrant and is therefore not included in the Obamacare reforms. Students, temporary workers, exchange visitors, au pairs, and other temporary visa holders are not part of the Affordable Healthcare Act and must make sure they purchase their own visitors insurance before coming to the United States. Many people are under the misapprehension that the arrival of Obamacare means the dawn of free healthcare in the United States. Nothing could be further from the truth. Healthcare in the US is, and will continue to be, expensive for visitors and non-residents. If you are traveling to the United States and you are not a citizen or resident of the country you will not be able to take advantage of the subsidized healthcare plans offered by the Obamacare reform. If you travel without health insurance, you will need to pay for your own medical treatment out of your own pocket. Healthcare in the States is never likely to be free. In the US, a doctor’s visit for a minor condition like the flu costs a few hundred dollars. If you suffer a broken leg you may be surprised to receive a bill for up to $80,000. And when you think about a serious auto accident, or a skiing accident that requires an airlift off the mountain, you can see the huge risk in traveling to the United States uninsured. For these reasons, a visitors insurance package is essential for visitors to the United States. Visitors health insurance is a form of short-term health insurance for travelers and visitors to the United States. 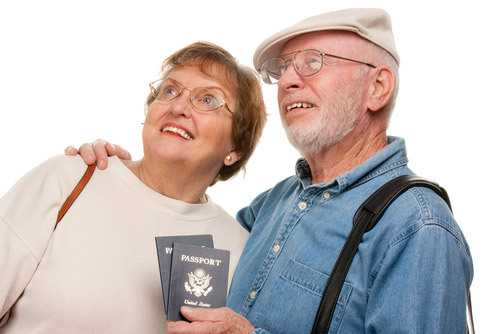 Relatives and parents visiting people in America, tourists, temporary workers, and exchange visitors all purchase visitors insurance to safeguard against the cost of accidental injury or unexpected sickness that may strike during their time in the United States. Visitors insurance is a form of travel insurance and it is a private plan for voluntary opt-in – for example, you don’t normally get visitors insurance through your work, or as a form of benefit. This insurance is valid only for the time period specified in the policy and for the countries listed in the plan.